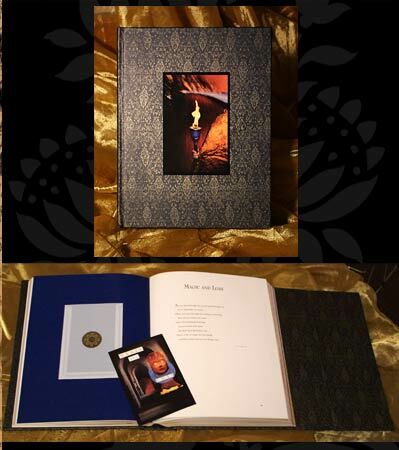 Gateways of the Divine is a visionary and poetic journey into the realms of darkness and light. Containing over two hundred-fifty passages of sacred poetry and mystical writings, this seven-pound book is an anthology of wisdom like no other. A successful marriage of art and literature, Gateways of the Divine helps us penetrate the veils of illusion and navigate our passage inward. The voices of Rumi, Rilke, Kabir, Tagore, and Gibran, to name a few of our fellow travelers, offer comfort and solace on the challenging journey to wholeness. Colette invites us to go Beyond the Veil through forty-four original collages presented in the form of divination cards. She has skillfully gathered words and images from our printed media to create a modern mythology, a sacred visual language that is potent and accessible. These images are provocative, disturbing, and inspirational. Colette has consciously veiled each card in a vellum pouch at the beginning of each chapter. It is as if these “veils” offer protection from the darkness and light these Gateways contain. This innovative presentation supports the participants in exploring these chambers at their own pace. The writings that accompany each Gateway offer essential guidance in being at peace with these challenging reflections. Gateways of the Divine is a treasure that can help us accept the unacceptable; a life-long companion which guides us in traversing the uncharted territories within ourselves. COLETTE VAN PRAAG has dedicated her life to the path of healing artistry and service. Colette is a visionary collage artist, a passionate performer of mystical poetry, and the creator of Gateways of the Divine, which was also featured in an inter-faith service of remembrance at Washington National Cathedral to commemorate the first anniversary of 9/11. 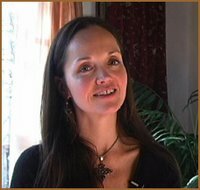 During the past five years, Colette has been embodying the wisdom of Gateways of the Divine by offering poetic performances and ceremonial presentations from the book at conferences, retreats, and private events. Drawing on her studies of Indian Temple dance, Jungian psychology and Expressive Arts therapy, Colette weaves together initiatory poetry, divination and sacred dance as a means of revelation and healing. This year Colette was the Artistic and Program Director for Wisdom University's "New Chartres School," a seven-stage mystery school that is being held in Chartres, France over the course of the next 7 years. At the inaugural intensive this past summer, she was the Poetic Oracle for the initiation ceremonies. Colette is currently working on her next book, Alchemy of the Divine: Visions of Initiation and Transformation, a modern-day alchemical initiation that represents the next octave of consciousness that began with Gateways of the Divine. Reviewed by: Carolyn Scripps, who is a writer, a mother and a modern mystic. She is a contributor to the recently published A Healing Divorce, by Phil Penningroth, and Sacred Feathers by Maril Crabtree. :: Get access to Temple of the 11 Gateways from Divine Gateways website by clicking here.